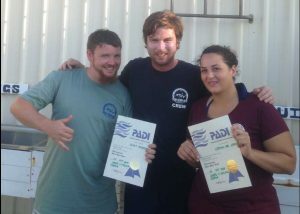 Summer is here and we have fantastic diving at Wolf Rock this month, including two newly qualified locals! Congratulations to Scott Higham and Crystal-Lee Lewis who completed the PADI Open Water Course with Wolf Rock Dive last month. This is the first Open Water Course we have completed since our take over of ownership two years ago, and it went really well. The guys completed the theory element in the shop, the confined exercises in the Sports Club swimming pool and their first two Open Water dives at the shallower ‘Round Bommie’, off Double Island Point. The conditions were favourable and we managed to finish the last two dives at Wolf Rock! Even with a limited maximum depth of 18 metres the guys still saw grey nurse sharks, leopard sharks and all manner of rays. We even saw a pair of mating octopus! We have a lot of male grey nurse sharks on the site swimming up very closely to the divers, the males are now looking to mate so are pretty inquisitive, giving our guests an up-close interaction! We have also seen large ‘fevers’ of eagle rays up to 40 in number, hanging around in the blue around Wolf Rock. These graceful rays are named Mobulas and are the smaller relative of the majestic manta ray. The site has been showing us a huge variety of different species this month. Not only sharks and eagle rays but also manta ray, sea snakes, leopard sharks, bull rays, cowtail rays and silky sharks. The site is definitely living up to its name as Australia’s best shark and ray dive! Daily dive charters, advanced dive courses and beginner courses are available for groups on request. We look forward to getting more locals diving and experiencing Australia’s Best Shark And Ray Dive. If you have ever thought about becoming a diver give us a call for a chat: 07 5486 8004. Community welcomes new locals at Who’s new at the zoo – 2!